WASHINGTON — NASA is implementing strict new limits on employee travel and explicitly banning agency-funded participation in several prominent conferences this spring as the agency absorbs a 5 percent budget cut imposed March 1 under sequestration. NASA Administrator Charles Bolden issued new guidance March 13 that states that "NASA funded participation will not be allowed" at either the National Space Symposium being held April 8-11 in Colorado Springs, Colo., or the American Astronautical Society's Robert H. Goddard Memorial Symposium being held March 19-21 in Greenbelt, Md., and the Goddard Memorial Dinner being held March 22 at the Washington Hilton here. SpaceNews is a media sponsor of the National Space Symposium. Restrictions are even tighter for travel outside the United States. Currently, no foreign conferences are approved for NASA participation. Meetings now off limits to NASA employees and their contractors include: the International Astronautical Federation's Spring Meeting in Paris, March 18-20; the European Geosciences Union General Assembly 2013 in Vienna, April 7-12; the Sixth European Conference on Space Debris in Darmstadt, Germany, April 22-25; and the Rotary International Conference in Lisbon, Portugal, June 23-26. A NASA spokesman said agency employees and contractors may attend the National Space Symposium at their own expense but NASA will have no official presence at the conference. 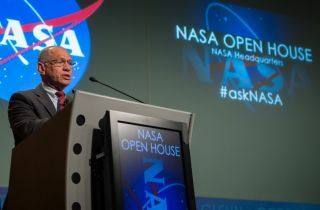 Bolden and his deputy, Lori Garver, were among NASA officials scheduled to speak at the annual meeting, which draws thousands of government and corporate space officials from around the world. "[W]e won't have a booth there and NASA personnel aren't attending," NASA spokesman Allard Beutel wrote in a March 15 email. "The show will go on," said Space Foundation spokeswoman Janet Stevens. "It will be awesome as usual. We will miss our NASA partners if they ultimately are not able to attend." The Space Foundation still expects a large U.S. military presence, thanks to the symposium's proximity to Air Force Space Command, and the usual assortment of aerospace contractors, commercial companies and international space officials. "It's a shame that at a U.S.-based space symposium our own space agency won't be represented when we have representation from all over the world," Stevens said. NASA bought a large booth across from Boeing Co. at the front of the otherwise sold-out main exhibit hall. Stevens said booth fees are no longer refundable. She did not say how much NASA's booth cost. The smallest booths cost roughly $10,000. Beutel did not have a figure for how much NASA spent preparing for the National Space Symposium or how much the agency now expects to save by not participating. He said all the travel NASA booked for the symposium is refundable. Belt-tightening efforts shaved $21 million off NASA's 2012 travel bill, Beutel said. A key difference between revised travel rules NASA issued last year and the guidelines issued March 13 is that the new directives ban official participation in several conferences by name. "What I think we didn't quite anticipate is that specific events would be singled out, with no travel expenses allowed for these because they didn't meet certain criteria," James Kirkpatrick, executive director of the American Astronautical Society, said in a March 14 phone interview. Each year, the society hosts its annual Robert H. Goddard Memorial Symposium the same week as the National Space Club's Goddard Memorial Dinner — an invite-only event known informally as Space Prom. "People come to town for one or the other, and go to both," Kirkpatrick said. The Goddard symposium will still feature a NASA-heavy roster, including Bolden. Chris Scolese, director of the nearby Goddard Space Flight Center, will also attend. This, Kirkpatrick said, is because employees based at either Goddard or NASA headquarters work close enough to the Greenbelt Marriott that a trip there would not count as travel. But because of the new travel restrictions, NASA center directors from out of town who were scheduled to speak at the conference, including the heads of the Kennedy Space Center in Florida and the Ames Research Center in Mountain View, Calif., have pulled out of the conference. For as long as the current travel guidelines remain in effect, Kirkpatrick expects this pattern to repeat at conferences around the country: Local NASA employees will attend, but those from out of town will not.